Day by Day guides have headed the best-seller lists in every year of the past decade, and the reason for their success is that they deal with fast-emerging touristic favorites. Istanbul is the latest example of an immensely-popular new destination. In 184 compact pages profusely illustrated with four-color photos and maps, Frommer's Day by Day Guide to Istanbul takes you to and through the Blue Mosque, Topkapi Palace (and its harems), the Grand Bazaar (operated since 1460), the many Turkish Baths, and more, while never failing to list the practical choices in lodgings, meals, shops, and other attractions. Terry Richardson has been exploring Istanbul and the rest of Turkey since the early 1980s. 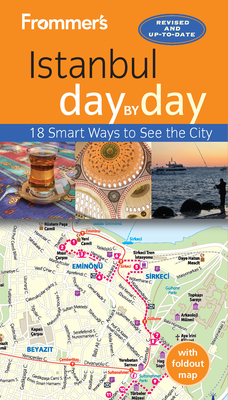 He writes and updates several guidebooks to both the country and its leading city, and contributes regular travel features to a number of international and Turkish newspapers and magazines. He also leads groups of history and archaeology enthusiasts through Istanbul's incredible past. After twelve years residing in Turkey, he now divides his time between his native UK and Istanbul. Rhiannon Davies fell in love with Turkey after a cycle trip across the country's remote Anatolian plateau. She was soon lured to cosmopolitan Istanbul, where she works as Arts and Culture Editor for travel and lifestyle magazine, The Guide Istanbul. Always on the look-out for something new, she lives in the heart of Istanbul's vibrant entertainment quarter, and spends her free time exploring the city's restaurant, art, and nightlife scenes. She speaks Turkish and is always seeking out regional recipes to add to her collection. Rhiannon resides in Istanbul.